Cake Decor in Cairns: ☆NEW!☆ Welcome to Top Tip Fridays! ☆NEW!☆ Welcome to Top Tip Fridays! Each week I will post a new baking or cake decorating tip. Please + or comment if you think it's a great idea! But rarely would do I use the full 600ml and end up forgetting about it lurking in the back of my fridge! (Not so nice when discovered weeks later! Eeek!) So now, instead of letting it go off and wasting money I freeze it for later use. 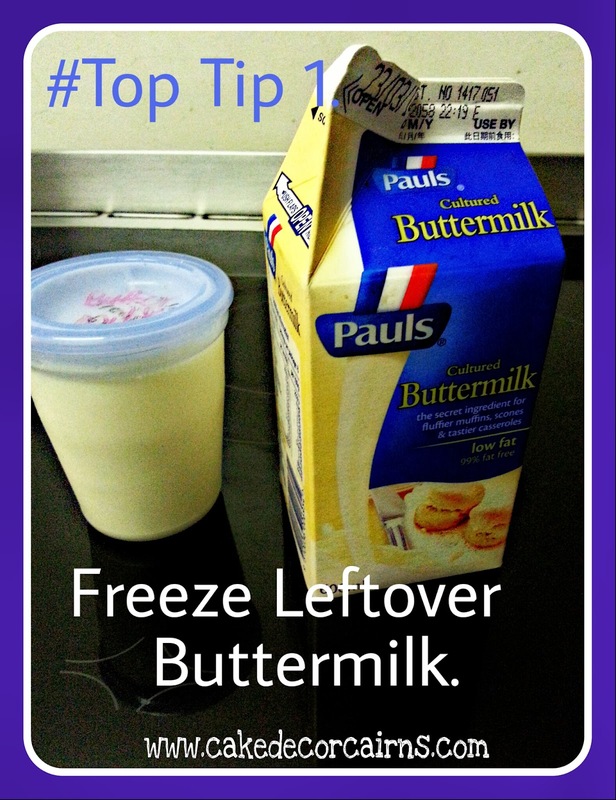 So, remember to freeze your next lot of excess, and when you next need buttermilk all you have to do is put in your fridge the night before to safely defrost or use your defrost settings on your microwave. * Note, It will look strange once defrosted - If you've ever frozen breast milk before you will be familiar with it looking separated once defrosted. The milk is still perfectly fine to use and a gentle stir will quickly bring it back to looking normal. Cake Decor in Cairns ♡ Home Bakers Doing it For Themselves.